Mussert was a young engineer who came to the fore in the interwar period as a strident right-wing populist. He co-founded in 1931 the Netherlands’ homegrown Nazi knockoff, the Nationaal-Socialistische Beweging; by 1935, it was polling 300,000 votes. Mussert of course welcomed the German incursion into the Netherlands on the way to someplace else. 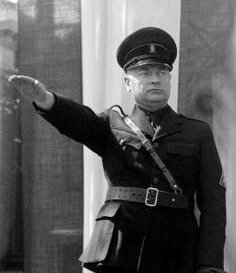 That put the Dutch under wartime Nazi administration, but Mussert didn’t score a Quislingesque head-of-state plum out of the arrangement. Instead, Mussert found himself brusquely shut out of any real power; the Austrian Arthur Seyss-Inquart ran the country instead, and would eventually hang via the Numremberg trial for his occupation atrocities, such as the wholesale deportation of the Dutch Jewish population that swept up diarist Anne Frank. Plum or no, however, what Mussert had done was more than enough to elevate him to the most conspicuous Nazi collaborator in the postwar Netherlands. Mussert was captured after the war and shot at the open-air location near The Hague where over 250 people had been put to death during the war years.